LAGOS: The literary world is once again shining a spotlight on Africa. There are new prizes: the South Africa-based PEN Studzinski Literary Award for short stories, and the Penguin Prize for African Writing, a pan-African prize covering both fiction and non-fiction genres. There’s a new book series, the “Penguin African Writers Series,” which will include not only new books from emerging writers, but also classics taken over from the defunct Heinemann African Writers Series. And next year South Africa will be featured as the “Market Focus country” at the 2010 London Book Fair and African writing will be showcased at the Gothenburg Book Fair. The African ‘Greats’–Ngugi, Soyinka, Gordimer, Okot p’Bitek– have given way to a new roster of names — Chimamanda Adichie, Chris Abani, Helon Habila, Binyavanga Wainaina, Sefi Atta, Monica Arac de Nyeko, Chika Unigwe, Brian Chikwava — who have become the new faces of contemporary African writing. This explosion of literary talent and publishing opportunities might be likened to a similar one that accompanied the heady post-independence days of the 1960s. But in spite of all the inspiring and exciting happenings of recent years, there still remain nagging questions regarding who exactly are the proper ‘gatekeepers’ of African literary tradition and production. Such “questionable depictions of strangeness” are to be expected in a world where the production (editorial and publishing aspects at least) of ‘canonized’ African Literature is largely in the hands of ‘outsiders.’ Speaking during the Publishers’ Panel at the 2009 Cadbury Conference at the Center of West African Studies at the University of Birmingham, British-Ghanaian Publisher (and former Commissioning Editor of the Heinemann African Writers’ Series) Becky Ayebia-Clarke (who is now running her own press, Ayebia Publishing) described how her displeasure with the cover of Tsitsi Dangaremba’s debut novel, Nervous Conditions (The Women’s Press, England, 1988) – another questionable depiction of strangeness – led her to produce a radically different cover for the Ayebia edition (2004). She felt that the image portrayed on the original cover did not do justice to the strong, sassy characterization of the novel’s heroine. But such “strangenesses” are to be expected when a significant part of what is known globally as “African Literature” lies outside the hands of its creators and in the tight grip of “institutions” that seem to possess fixed ideas about what African literature should or should not be, and what “authentic” African “characters” can or cannot do. In Birmingham, Ms. Ayebia-Clarke also spoke of the inspiration behind her publishing an anthology of love stories written by African women (African Love Stories, Ayebia, 2006) — her dismay at realizing that there was a scarcity of daring love stories featuring African characters. Apparently, at least in the eyes of most publishers, it is more authentic for Africans to make war than to make love. The synopsis for the book as featured on Ayebia Publishing’s website describes it as “a radical departure from conventional anthologies and the theme of love is aimed at debunking preconceived notions about African women as impoverished victims, whilst showing their strength, complexity and diversity.” One of those stories (Ugandan Monica Arac de Nyeko’s Under the Jambula Tree), which dealt with the subversive (at least in an African context) theme of lesbian love, won the 2007 Caine Prize for African Writing. At the recent “What’s Culture Got to Do With It” Conference in June organized by the Nordic Africa Institute in Uppsala, Sweden, Professor Raisa Simola, presenting a paper that touched on Uzodinma Iweala’s 2006 novel Beasts of No Nation, informed the audience that while BONN has been translated into Finnish, its revered ‘ancestor’, Things Fall Apart, has yet to be translated. The interesting question therefore is – who makes these translation decisions, and on what basis? Also at the Uppsala conference, Nigerian Professor J.O.J Nwachukwu Agbada complained of the gross disservice done to scholars and academics based in Africa as a result of the fact that the bulk of cultural production (in this case, literary publishing) is managed from the West, thus ensuring that many books by African writers and journals on African Literature/Culture are unavailable to Africans living on the continent. These books win awards and establish their positions in the African literary canon in the West, but most Africans remain unaware of them. But all of this is not to take away from the obvious fact that these are interesting and even exciting times for African writing. African literature (an endlessly debatable term in itself) is in the middle of the kind of renaissance that characterised Indian writing in the 1990s. We are witnessing the strong rise of a literary movement, defined not so much by grand nationalistic or ideological themes (as was largely the case in the 60s and 70s) as by a fervent and uncomplicated desire for Africans to tell their own stories, whatever those stories may be, however marginal they may appear to a world that wants to talk only about African poverty, famine, wars and child soldiers. The last few years have seen the emergence of innovative independent literary collectives and publishing houses based on the African continent – Cassava Republic and Kachifo in Nigeria, Storymoja and Kwani in Kenya, Chimurenga and Wordsetc in South Africa — all of whom are committed to taking Africa’s literary talent to the world, using every available means, and certainly not shying away from the exploiting the possibilities of the internet revolution. And by the end of 2010, novels by the following “new” African writers will have been published by some of the biggest names in contemporary publishing: Petina Gappah, Brian Chikwava, Peter Akinti, Chika Unigwe, Adaobi Nwaubani, Teju Cole, Kachi Ozumba and Lola Shoneyin. Six of those will be debut novels. Most interesting however, and worthy of reflection, is this surprising fact: all but one of the eight names mentioned above live outside the African continent. This is often interpreted to mean that there are two kinds of African Writers – ‘home-based’ and ‘diaspora’ writers, and that the Global Publishing Factory prefers to ’employ’ African writers based abroad to tell the stories of Africa. That argument of course is a debatable one; the fact that writers abroad get more publishing opportunities than home-based ones might simply be attributable to geographical proximity to the ‘centers’ of publishing, and not to any prefabricated preferences on the part of the publishers. Debates like this will continue to dominate discussions about contemporary African writing. Geographical location and exile, language, authenticity, even the supposedly simple matter of “who is an African writer?” will be difficult issues to ignore. Chinua Achebe perhaps summed it up best when referring to the new Penguin African Writers’ Series, of which he has been named as Editorial Advisor. He remarked: “The last five hundred years of European contact with Africa produced a body of literature that presented Africa in a very bad light and now the time has come for Africans to tell their own stories. 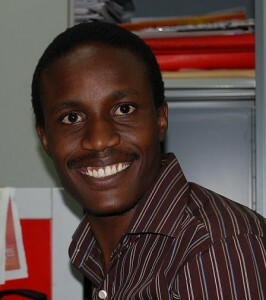 Nigerian writer Tolu Ogunlesi was short listed for the 2009 PEN/Studzinski Literary Prize, and recently won the arts and culture prize in the 2009 CNN Multichoice African Journalist Awards. When he is not traveling he divides his time between Abeokuta and Lagos in South-western Nigeria. FOLLOW: Ogunlesi’s travels via his blog. MORE: Ogunlesi on indigenous African writing.